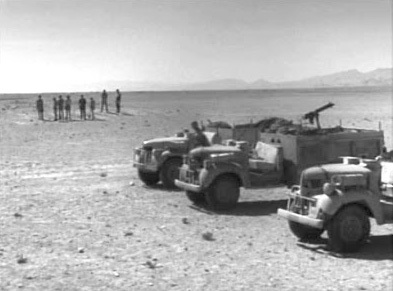 On the eve of the Battle of El Alamein, a unit of the British Army’s Long Range Desert Group undertakes a mission to destroy a German fuel dump. The target is 500 miles behind enemy lines and even if the team destroys it, returning may be the tougher part of the mission. 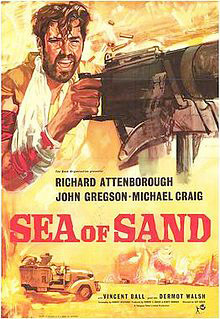 The conflict in Sea of Sand is not just between the British and the Germans. In fact, the principal foe appears to be the desert itself. Actual combat occupies much less time than does crossing the desert. 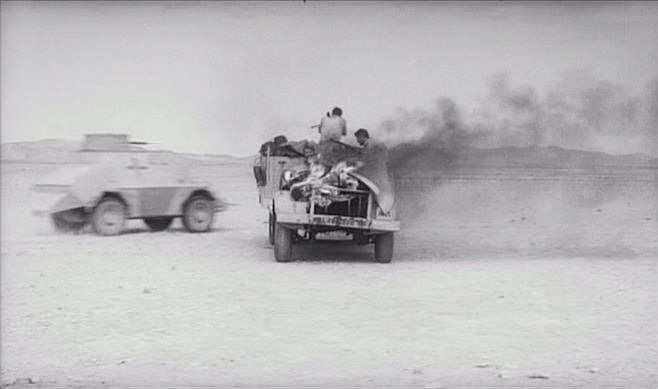 Though there is excitement in the battle scenes, especially in an attack by a lone German armoured car, the tension that arises from having to survive the environment is greater. 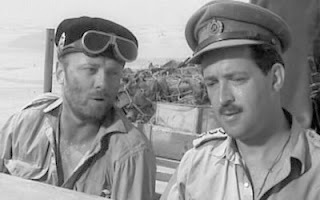 There is also conflict between the team’s commander (Michael Craig) and the Royal Engineer captain (John Gregson) attached for the clearing of a minefield, but this part of the film is predictable. The unit is made up of the usual diverse soldiers (including Richard Attenborough, Barry Foster and Ray McAnally) but the script, though it treats each individually, eschews (or perhaps simply pre-dates) the later convention of making them all misfits. 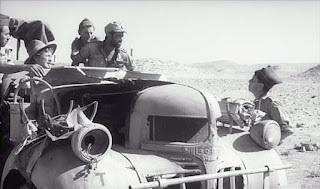 An interesting feature of the ensemble is that, though they argue and get on each other’s nerves, there is a true sense of camaraderie among the team, some of whom have known each other since the beginning of the desert war. Sea of Sand illustrates, for me, my belief that the war movie, at least in Britain, reached a peak of realism in the fifteen or twenty years following the Second World War. During the war, it was too greatly influenced by the need for propaganda, and then, after a couple of decades, came fanciful storylines, which, embellished by the gritty cynicism of the 1960s and ‘70s, were nonetheless often fairy-tales compared to those of the immediate post-war years. I think this was caused by the fact that following the second world war, most of the people participating in films, both before and behind the camera, were also participants in the war. And in Britain, more than in North America, those watching the films had also felt the direct effects of combat. So anything unauthentic would have been noticed right away and treated with scorn and derision. Some melodrama or poetic licence in plot and characters was permitted, but nothing too fantastic, as everyone in the audience would have known the sort of people portrayed on the screen, in one form or another. This perhaps explains why the British excelled in what later came to be called ‘docudramas’ (or ‘dramadocs’), films that combined the factual background or details of real-life with the fictional story-telling of films. It may also be why, with the rise of a new generation in the 1960s, they died out at the beginning of that decade. 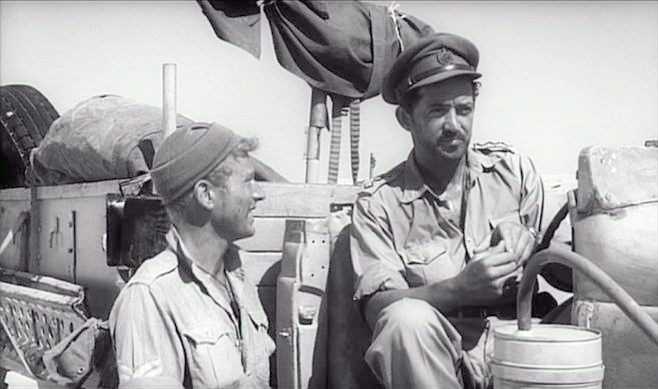 While some may find Sea of Sand too slow for a satisfying action flick, it is a good example of the interesting and well, if inexpensively, made war films from Britain in the 1950s. That's a good point you made at the end about docudramas of that period needing to be more realistic. It's a great pity that this need seems to be dying out. That reminds me--yesterday I watched Gary Oldman in "Darkest Hour." I can't say how strictly realistic it was (my guess is, "not particularly,") but I enjoyed it. I didn't think Oldman made a very convincing Churchill, but otherwise the film was quite well done. Churchill has certainly had some diverse actors take a stab at portraying him. When I saw that Oldman took on the role, I was dubious, even though he is a very good actor. I think my favourite in the role - and probably the closest to approach Churchill's appearance - not easily done, really - is Robert Hardy. See his taped one-man stage-show, if you can. Even good actors seem to run into problems when they play famous historical figures. A self-consciousness sneaks in--"Ooh, look at me! I'm portraying an icon, Oscar voters!"